All palm enthusiasts will grow plants in containers. This article concentrates on information about growing palms in containers. Also discussed are plant repotting recommendations, potting soil mixtures and cultural requirements. The reader can fin a solution for watering, fertilizing, sun/shade, cold protection and pruning problems. Anyone interested in growing palms must have some familiarity with growing palms in containers. For a seedling to get large enough to be introduced into the garden, it must initially be grown in a container. Even the hobbyist should utilize containers in his home nursery as he accumulates palms for future plantings. 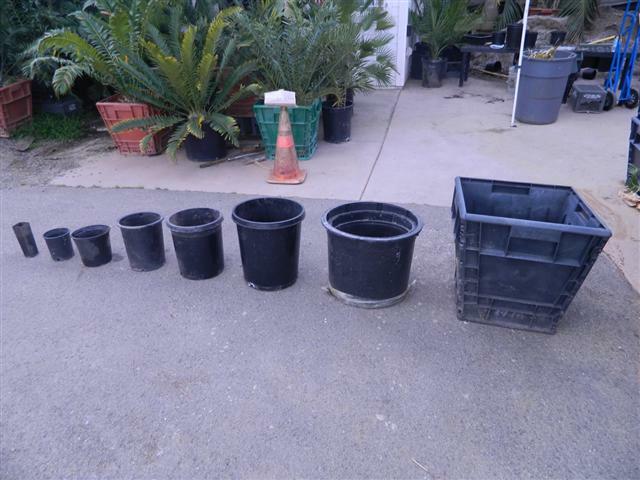 Container culture is the mainstay of commercial palm nurseries. From left to right, 15 gallon, 7g, citrus pot, 5g, 2g, and 1g, Band container (not shown) is our smallest pot. The first consideration is what type of container to use. The industry standard is now a black plastic pot with UV stabilizer manufactured into the plastic. Alternatives include plastic grow sacks, clay pots, ceramic pots, or even containers made of recycled paper material that can be planted directly into the ground. Pots come in many shapes and sizes. They can be large enough to grow mature towering specimens. For extremely large plants, wooden boxes are often utilized. Actual shapes, sizes, and designs vary around the world. In the United States they are typically sized according to inches or gallons. Most other countries size their containers according to volume in liters or centimeter diameter and depth. Some areas are utilizing square pot designs that conserve space on growing benches. It is imperative that any pots used have ample drainage holes, typically in the bottom of the container. Grow sacks offer the advantage of being more affordable, but do not last as long need stabilization to avoid falling over. Clay pots are attractive but need more frequent watering and break easily. One must utilize what is available and affordable in your area. A container must give ample soil volume for growth and weight for stability. In general, palms prefer deep pots to shallow ones. One would start a seedling in a small pot and repot it over the seasons in progressively larger containers until it is of sufficient size to plant in the garden. There are as many potting mixes as there are growers. No single mix is ideal for all growers, all species and all localities. A grower has to use what is available to him and what works well for him. An ideal soil will offer a substrate for the roots to stabilize, provide a source of water and oxygen, and offer nutrients for growth. Good drainage is also desirable for most species. One would like to see a universal potting soil, but in reality there is no such thing. We all tend to utilize one mix with which we have success. Then a grower will find that others are having success with an altogether different mix. In surveying many growers in Southern California, I found the soil component common to most growers mixes was coarse sand - otherwise they were as different as night and day. Most growers also used peat moss and perlite. Mixes varied from quite complicated formulas to something as simple as one half peat moss, one half perlite. This spectrum of mixes utilized is probably a commentary that palms will survive in many types of soil. Knowing that the reader would like to read at least one palm tree soil recipe, I will give one below that has worked for me. I utilize a mixture of coarse sand (#12), fir bark (1/8 to inch), redwood shavings, coarse peat moss, perlite (#2), pumice (ground lava foam), and sometimes a small amount of topsoil. This makes a rather acidic mix, so I add one to two pounds of dolomite lime per yard of mix and about one pound of slow release fertilizer with microelements per yard. This preparation gives a mix with a pH of approximately 6.5. For seedlings I lighten the above mix with extra perlite, peat moss, and redwood shavings. If a mix repels water on first watering (a high concentration of peat moss), you can use a wetting agent. Also remember that high peat moss mixes when allowed to dry out severely actually contract and become next to impossible to wet again. 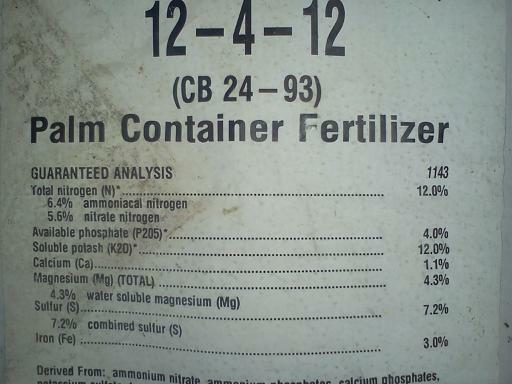 Most growers do not sterilize their mix because of cost concerns. In summary, experiment with what's available in your locality and get advice from experienced growers and ask what's worked well for them. Remember that any mix must offer support for the plant and simultaneously good drainage. The lighter the mix, the less it literally weighs and the greater the drainage. The heavier the mix, the more it weighs and the slower the drainage. Drainage is increased by adding perlite, peat moss, pumice, or coarse wood chips. Topsoil, decomposed granite and fine sand slow drainage. Larger specimens and arid loving species tend to prefer the heavy mix. Seedlings and tropical species like a lighter mix. The density of a mix is best appreciated by feeling it with your hands or actually lifting a container with the mix to feel the weight. Most commercial potting soils are considered light mixes. It is not recommended to recycle old mixes, regardless of the composition. The principals of watering container plants are similar to watering garden plants with a few exceptions. Container grown plants tend to be more subject to drying out. Container plants are totally dependent on what you give them. One can lose a container plant more easily and these plants roots do not have the option of searching for deeper water or nutrition in the garden. Therefore, you must observe for dryness of the soil surface in the pot. When watering, one waters fully such that he sees water coming out the drainage holes. Later, repeat watering is performed when the top inch or two of the soil is once again getting dry. Never wait until the bottom soil in the container is dry. Dry or hot conditions require more frequent watering. Moist or cold conditions usually require less frequent applications. Fixed watering programs without plant inspection invariably lead to problems. Small seedlings, especially in a light mix, require typically require more frequent watering. Obtain appropriate equipment that makes watering easier for you. We like watering wands with dispersion devices at the end - as shown to the left. A full blast hose can splash dirt out of the pot. A major problem with container plants (as opposed to garden plants) is that there is a potential for salt buildup with the containers. 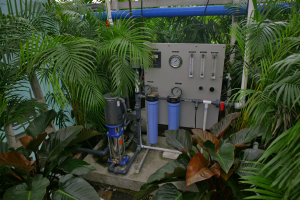 Most palm enthusiasts cannot afford to use complicated water production systems that remove salts from the water. Instead they must utilize water supplied by their municipality or well water. Both of the latter usually contain dissolved salts, which, along with fertilizers you give to the plant, can result over time in causing a salt buildup in the soil. This is particularly true with interior grown house palms. This buildup can result in leaf tip discoloration (burning), general plant decline and eventual death if not corrected. Some species are more tolerant of salt buildup than others. A simple soil salt meter with metal prongs can be inserted into the damp soil to measure soil salinity. Other similar devices can check soil pH. An ideal pH for palms is 6.5 to 6.8. Salt buildup is a major problem with houseplants that receive limited water and are never thoroughly drenched or leached. 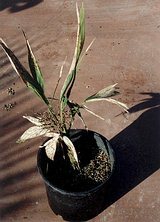 Affected plants just look sickly and perform even worse than expected and demonstrate a slow general decline in their appearance. Leaching the pot with repetitive and generous amounts of water may help drain out unwanted salts, especially if one uses collected rainwater or distilled water. Heavy rainstorms are in this way quite helpful in leaching salts from outdoor plants. Avoidance of this problem includes watering with generous amounts of water on a regular basis and regular leaching program prior to the salt buildup. You can also use distilled water or a reverse osmosis system (not as large as the one we have at the nursery - see photo) Also, one must carefully use fertilizers and meter the soil content at regular intervals. One will be surprised to find that a large number of those plants that just don't look right are actually suffering from salt buildup. To understand fertilizers, one must understand what fertilizer is and does. Fertilizer is a substance that gives nutrition to the palm for growth of the leaves, trunk and roots. It may be derived from an organic source (blood meal, bone meal, manure, fish emulsion, etc.) or inorganic (purchased chemical fertilizers). Its major components (major nutrients) are nitrogen, phosphate (phosphoric acid), and soluble potash (K20) and the concentration of these components is given as the N/P/K ratio. Palms generally like a ratio of approximately 3:1:3, such as 18/6/18 or a similar formula. Minor nutrients (microelements) are the elements necessary in trace amounts yet still very important to overall palm growth. These include such things as iron, manganese, copper, zinc, boron, and molybdenum and other things. 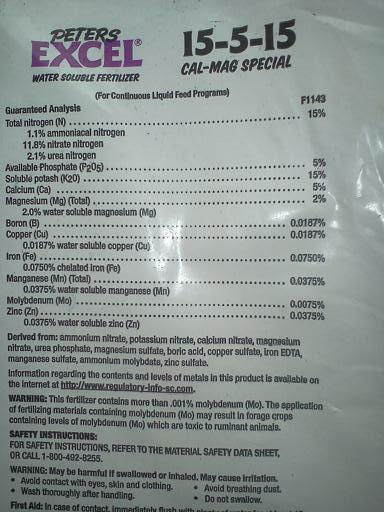 The minor elements may be part of a fertilizer formula or can be used separately. There are maladies described for specific deficiencies of all fertilizer elements, especially in high rainfall areas. Organic fertilizers (except for steer manure) are slower acting and have less chance of burn. For greening up yellow leaves, bloodmeal is one of our favorites. Regular chemical fertilizers typically are faster with more chance of burn. Slow release chemical fertilizers diminish but don't eliminate this risk of plant burn. Soluble fertilizers are chemical fertilizers that go into solution. With an injector they can be quite efficient but require strict adherence to manufacturers directions. Fish emulsion is a soluble organic fertilizer and thus reduces chance of burn. 1) Follow the manufacturers directions. 2) Don't be too aggressive with fertilizers. Too much may quickly kill or damage your plant. 3) Never fertilize dry containers. Palms usually don't die from too little fertilizer but they die quite quickly from too much fertilizer. For a commercial operation, my own bias is toward the injector systems and low, frequent feedings of fertilizer. This can also be done for the home gardener. Always adequately pre-water any plant to be fertilized. Also, when broadcasting granular fertilizers, take care not to throw fertilizer into the crown of a small plant. Customized combinations of such things as blood meal, quick and slow release fertilizers and microelement agents can be quite successful and workable. 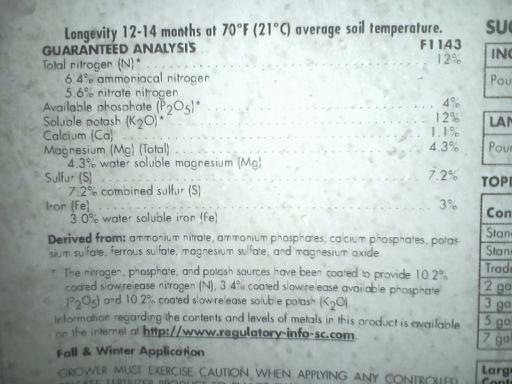 Amounts used and frequency of fertilization all depends on the fertilizer used. A new seedling is still dependent on nutrition from its seed and has small chemically fragile roots, so care must be taken to avoid overaggressive fertilization. 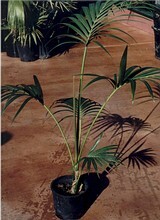 An older palm in a container can tolerate recommended dosages of fertilizer. A huge established palm in the garden can utilize sometimes shocking amounts of fertilizer. The safest thing is to follow the manufacturers directions, sometimes using less for safety. Year round fertilization is safe in tropical areas. However, in areas where cold winters are a factor, fertilizers should not be given after early fall. Late applications may initiate winter growth of soft new leaves susceptible to the cold. Winter applications of microelements may serve to replenish these compounds while the plant is inactive and after the rains have leached the soil. Foliar applications of very dilute fertilizer can be utilized to green up the foliage but should not replace applications to the soil. grown in deep shade. In brighter light it will be much more compact. Sun, shade, and humidity requirements are quite individual to the species. In general, most palms prefer full sun but there are definite filtered light and shade loving palms. Many sun seeking palms need to spend their early years in filtered light. A good canopy of taller palms can offer protection for the shade lovers. Also, as outdoor humidity lessens, many species tolerate less direct sun. Therefore, a palm which tolerates full sun in a coastal environment (i.e. Rhopalostylis sapida) may need sun protection in a dryer (and usually hotter) inland area. This is particularly important for desert growing. To the contrary, Brahea armata loves dry, hot conditions and has difficulty in tropical areas such as South Florida or Queensland. When one exposes an un-acclimated palm to full, hot sun, sunburn will result. It's easy to spot as this always occurs on the exposed parts of the leaves - just like with sunburn obtained at the beach. Gradual acclimation to sun will prevent this. To know if a given species likes sun, review reference books or check on this website or the Internet. Only experience in growing teaches which palms like a given locality. Ask advice from others with experience or give us a call. Many species like to work their way into the sun. Seedlings of sun loving species may need a year or two of filtered light before they are ready for full sun exposure. Also remember that shade loving plants can get "too much" shade and stretch out excessively. the outer portion of the leaflets that was more exposed sustained the sunburn. Too much cold can burn particularly susceptible palm species. The result is similar to a sun burn but is diffuse and not oriented toward the sun. At this Website we emphasize knowing how cold you get with a maximum-minimum thermometer. Each palm species has its cold tolerance and, at this Site, you'll find out what that is. It's quite predictable. If you push the plants cold limits too much, your plants will suffer. There are lots of methods for protecting plants from cold. The most commonly used is the placement of containerized plants into the home or garage when it's super cold. Or, you can wrap the leaves and even use Christmas Tree lights under the wrap. Another thing you can do is develop an overhead canopy. Overhead protection or canopy offers two kinds of protection. First, from the hot sun. Direct sun on leafs that are not acclimated can cause unsightly brown discoloration. Secondly and more importantly, from cold exposure in cold winter areas. This protection can be accomplished by constructed overhead shade cloth or naturally with fast growing species such as Caryota, Archonotophoenix, Syagrus, or Ravenea. Overhead canopy (synthetic or natural) can offer as much as 10 degrees protection from winters cold. Growers often talk of the ideal southern exposure for optimal growing results (in the US.) However, good eastern sun (morning sun) exposure is quite important in warming up the container after a cold winters night. If you experience cold nights, locate the containers where the early morning sun will do its job in heating up the plant. Cold protection can also be accomplished by placing plants close to the house or a structure. Anti-transpirant sprays (synthetic) and other applicants can also give some degree of protection from winters cold. Container palms can be pruned simply with hand held pruners or, for larger leaves, a hand held folding saw. If one needs to reach far overhead, many types of pole saws are available for purchase. Both pruners and a hand saw are shown to the left. One can also purchase hand operated loppers for large palm leaves. With the hand pruners, be careful to not cut the fingers of the hand that's holding the leaves for pruning. Unfortunately, this happens all too often. Most growers remove old leaves when they become unsightly. By this I mean that they are brown or ugly-looking. These older, dead leaves are almost always the lowest leaves of the plants crown of leaves. You can also trim the tips of leaflets that may be brown tipped. Avoid over-pruning as this can lead to loss of plant vigor. The petiole is cut close to the palms trunk. Leaf bases are allowed to age until they can be easily removed by hand. Premature removal of green old crown shafts will invariably cause permanent scars to the trunk, increasing the chance of bacterial or fungal infections. For the average containerized palm, you'll find pruning and cleaning it up takes just a few minutes. Remember, also remove any weeds at the base. Clean pruning equipment is recommended as various palm maladies can be transmitted by pruning gear. Cleaning can be accomplished by scrubbing with and then soaking the equipment in a 5% bleach solution. Ideally this would be done after pruning each plant, especially when pruning large plants or plants showing signs of disease. Most growers discard leaf debris, as it can become a reservoir for plant pathogens. One final point is to always protect your eyes. Protective goggles are recommended when pruning, especially when working overhead. Cut leaves can drop and hit your face or debris can float down and get into your eyes. Also, leaf spines can poke you. Given that other growing conditions such as sun exposure and cold are appropriate, most palm species can be grown in containers. You just have to give them appropriate culture. However, I should make several comments about container growing of palm trees. First, realize that most species do better in the ground. It is hard to reproduce the ideal water supply, nutrition and drainage of palms grown in the garden. These latter plants have a much greater volume of soil to deliver water and nutrition. But, with good care almost any palm can be grown in a pot. Also, some palm species grow very rapidly and their roots quickly outgrow their containers. Such a plants roots will demand more than the container can provide. Such a plant can become stunted if not repotted into a larger container. Another problem is a palm becoming too tall in its container. This problem can lead to instability during a storm or high winds. Palms such as Queen Palms, King Palms and Fishtails are examples of this. If you want to grow them, they need super large pots that, with soil, are heavy and won't blow over. Also, if you are container growing for inside the house, remember that some species don't do well indoors. This would include such plants as the King Palm, Shaving Brush Palm and the Royal Palm. We have an article at this site dedicated to "Palms as Houseplants" that will tell you which species do well indoors.